iSPIRT brings #PNCamp3 to Hyderabad for the first time. There are clearly established trends that successful SaaS startups have started to emerge from India on the global front – with products that are world class and leaders in their categories. These are very early stages of a transition from a IT services world to a SaaS software economy. 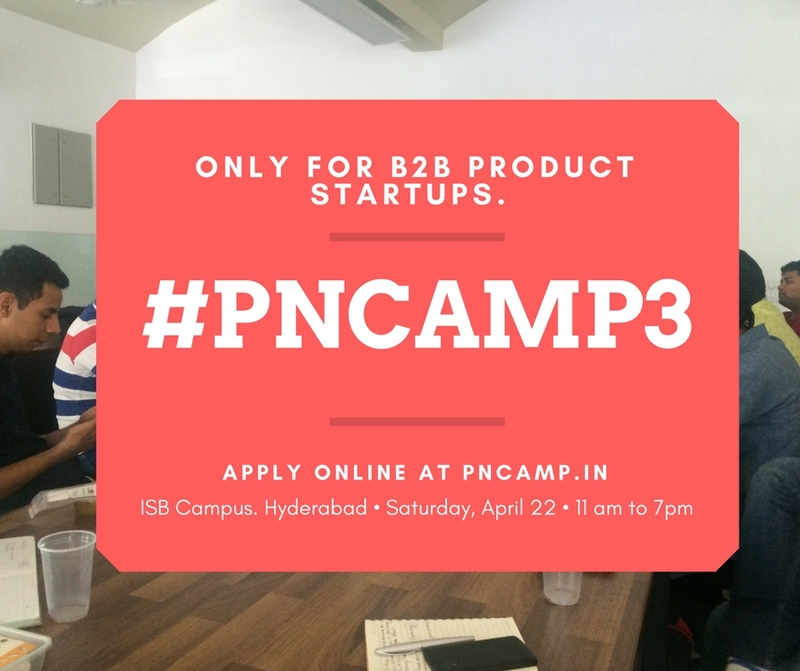 #PNCamp for the first time in Hyderabad is a bootcamp never before presented to entrepreneurs in the region. It is a roll-up your sleeves kind of format wherein you will get to see real examples of companies which are analyzed. Very precise feedback on how to make adjustments to the company’s approach towards success are presented to the audience. This is all a part of the product teardown process – where other successful entrepreneurs help do such analysis for participating companies. Rather than hear boring talks – the format will be centered around addressing the issues that participants raise as key concerns. There are three sessions where startups will present and get feedback. Product teardown: In this section, select startups will provide a quick walkthrough of their product website. As each startup will get limited time to present, key is to stay focused on most critical or concerning area of your product. Experts and fellow participants will provide feedback on core functionality, usefulness, right fit of the product, visual and experiential aspect of the product. In the past, such product tear down has help entrepreneurs get amazing inputs in matter of minutes. Moreover it has opened up doors for more insightful beta users from the cohart. Product teardown session focuses on product flow, functionality, identifying specific KPIs and using analytics to derive insights, and immediate critical aspect that might be hindering product traction or stickiness. Founders will get actionable inputs that can be applied next day and see improvements. If you are interested to seek feedback, please apply here. Idea to Launch (Unconference): The pre-launch phase is a very important phase in the development of your SaaS business and success in this phase can often accelerate growth once you launch to the public. Smart founders use this phase to understand as much as they can about who their ideal customers are, what their needs are and how much they would be willing to pay to get their problem solved. This session is in place to precisely discuss about this particular phase of your business. “What makes a good pitch deck”: One of the most important(if not the most important) resource your startup should spend time on is the pitch deck. Your pitch deck is the window to your startup. The way your pitch deck is structured can make or break your fund raising plans. What should you include in your pitch deck? Should it be too long? Or too short? What are the key metrics investors look for in a pitch deck? All these questions and more will be answered in this session. In this session we will do a pitch teardown of two selected startups. Investors from LetsVenture and successful startup founders who have raised money will analyze the pitches and suggest what works and what does not. They will give you pointers on how to calculate the key metrics and how to continue tracking them. This session is a must for startups who are looking to fund raise. The entire bootcamp comes together due to the energy infused by Founders who purely volunteer their time towards the cause of helping companies succeed. Successful entrepreneurs like Suresh of KiSSFLOW, Krish from ChargeBee participate in these forums purely with the desire to see a vibrant ecosystem of SaaS companies. Look forward to seeing you all for what will be the most hands-on bootcamp ever made available to entrepreneurs in Hyderabad. This is a MUST attend camp for any early stage product startup. Do not miss this unique opportunity to catch the brains of experts and fellow participants through product feedbacks and interactions. So, if you are an early stage startup looking to take your startup to next orbit, then register yourself right away at www.pncamp.in Lets build great product nation, one product at a time! See you at PNCamp.